Our team has 6 distinct personalities; that means we also have 6 different cultural backgrounds and 6 very different cooking styles. We love to cook and we love to eat! We thought we would share some of those old family recipes and trade secrets we’ve been holding onto. 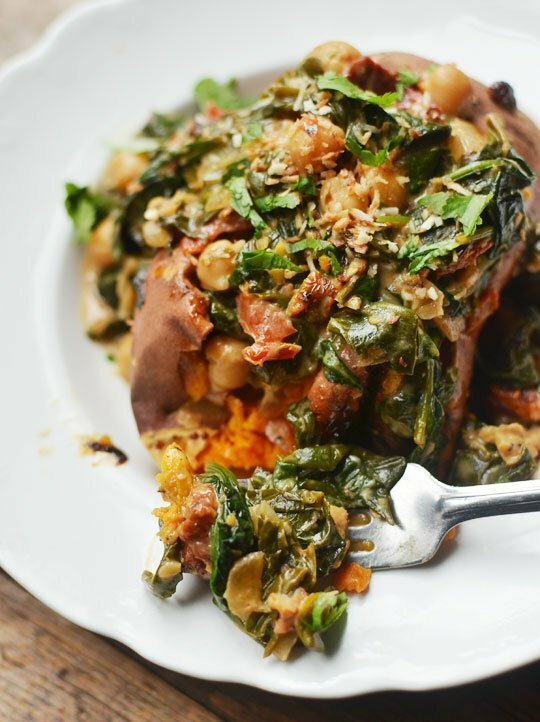 Green, tender spinach draped over a big, hot sweet potato! The Ruth & David Group is always in the mood for comfort food – even in August! This week we will be featuring a powerhouse dish with loads of flavor and solid sustenance from chickpeas and sweet potato. This is thick enough to eat on its own with a fork, but it’s saucy enough to eat over pasta, rice, brown rice, quinoa, or another grain. It’s not a curry, but the technique and flavor are pretty close to one. In the end, this is a healthy, easy-to-prepare recipe (that also happens to be vegan)! Heat the oil or ghee in a large, deep Dutch oven or heavy pot over medium-high heat. Add the onion and cook for about 5 minutes, or until the onion is beginning to brown. Add the garlic, ginger, sun-dried tomatoes, lemon zest and red pepper, if using. Cook for 3 minutes, stirring frequently. Add the chickpeas and cook over high heat for a few minutes or until the chickpeas are beginning to turn golden and they are coated with the onion and garlic mixture. Toss in the spinach, one handful at a time. This will take about 5 minutes; stir in a handful or two and wait for it to wilt down and make room in the pot before adding the next handful. When all the spinach has been stirred in, pour in the coconut milk and stir in the salt, ground ginger, and lemon juice. Bring to a simmer then turn down the heat and cook for 10 minutes or until the chickpeas are warm through. Taste and add more salt and lemon juice, if necessary.